Shown in the Large Lime juice and Pink, But available in over 150 color combinations and Three hair bow sizes. Featured on our boutique style hair bow, this monogrammed beauty is available in your choice of a 2 or 3 letter monogram in countless colors. A wonderful combination of hot pink and shades of apple green, accented with a apple green button, monogrammed with a hot pink initial . A wonderful combination of hot pink and Apple , accented with a apple green button, monogrammed in hot pink initial . A wonderful combination of hot pink, light pink and orchids, accented with a light pink button, then monogrammed with a Shocking Pink initial . A wonderful combination of pink with white hearts, accented with a white button and monogrammed with a pink initial . Featured on our boutique style hair bow, this monogrammed beauty is available in your choice of 1 , 2 or 3 letter monogram in countless colors. Choose from a barrette or matching headband. A wonderful combination of pixie pink, and lime. Accented with a pixie pink button, and monogrammed with a Lime initial . A wonderful combination of orange with hot pink polka dots, accented with a hot pink button, then monogrammed with a orange initial . Available in Five roman stripe colors and Three hair bow sizes. Accent all those black and white outfits. Select your choice of button color and initial. Available in five hair bow sizes. A wonderful combination of Lady bug print ribbon and accented with a red button, monogrammed with a black initial . Available in three colors. Available in Three hair bow sizes. A wonderful combination of white with black polka dots, accented with a matching black button, then monogrammed with a white initial . Chevron is everywhere ! Create a personalized chevron hair bow to match her outfit! 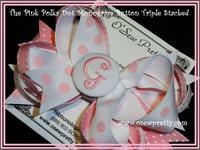 A monogrammed button on a classic twist hair bow in your choice of polka dot ribbon colors. Chevron Print Boutique monogrammed button hair bow. A wonderful combination of bright spring colors and accented with a hot pink button, monogrammed in a lime swirl initial .